📅 March 2019 March 8, 2019 by Bruno B. The Dalmatia region spawns itself across a big portion of the Adriatic coastline of Croatia – since Rijeka all the way down to the Dubrovnik region. Here are some of the best things to do in the Dalmatian Coast! With only about 50km at its widest point, it’s majorly a coastal region. I’ve explored some of it as part of my Croatia road trip and got completely addicted. 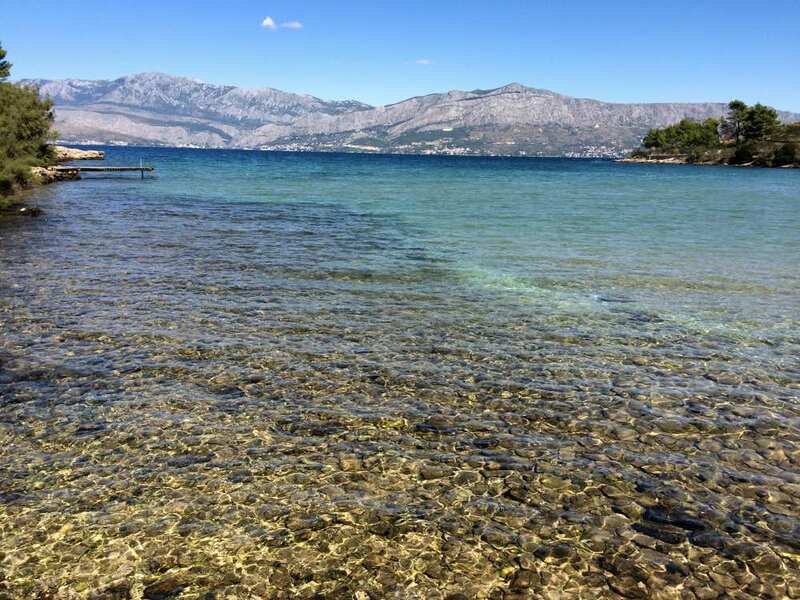 With no further ado, these are some suggestions of experiences in the Dalmatian coast, Croatia! On the western end of the coastline of Zadar (Riva), you’ll firstly find the Sea Organ (Morske orgulje). It’s an unusual seaside audio installation shaped into the form of several marble steps that descend into the Adriatic. Driven by a combination of waves and wind, it’s able to create oddly beautiful tunes and sounds expelled through little openings (whistles) in the stairs. This 70-meter long instrument was built in 2005 and earned its architect Nikola Bašić the European Prize for Urban Public Space in the following year. 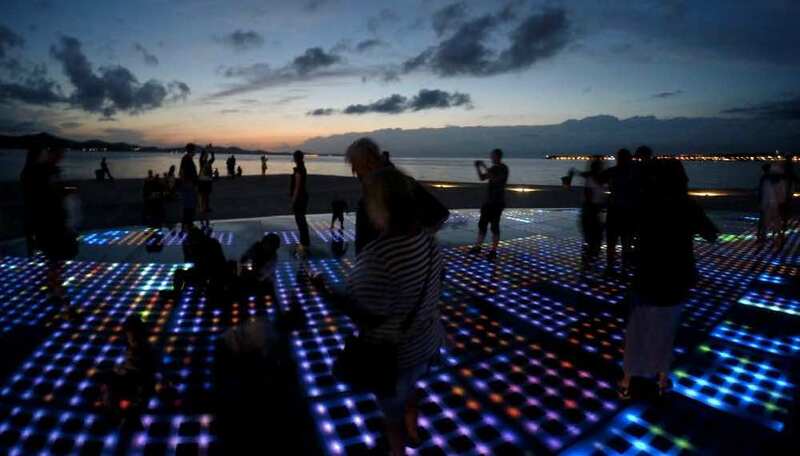 Just a few steps away, the Sun Salutation installation is a circle of LEDs and photovoltaic cells (solar panels) that come alive at night to create the most colorful sunset you’ll ever see. 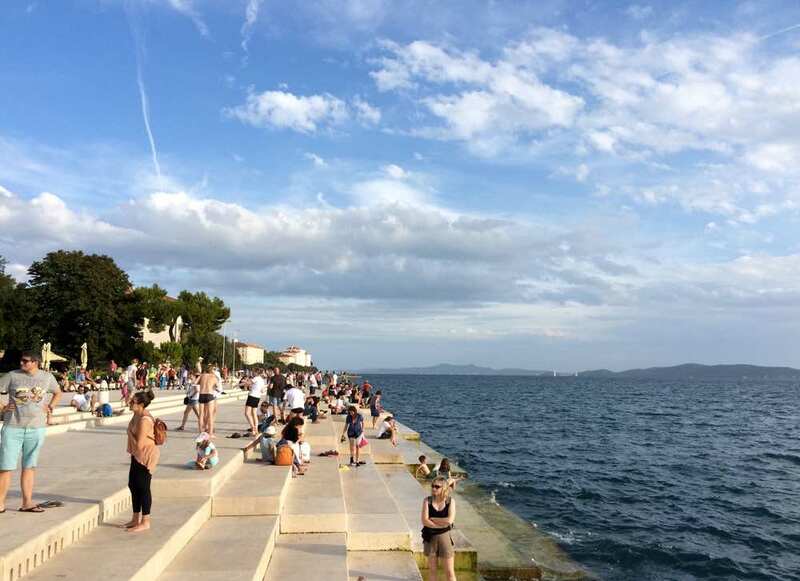 Just these two experiences make Zadar worth a visit! The lunch break in a secluded beach. Lokrum island is on the horizon. I think I’m becoming addicted to kayaking when I travel. It’s a great way to workout while getting to see your destination from a totally different perspective. Plus, the silence when you’re out there in the ocean or river is bliss! 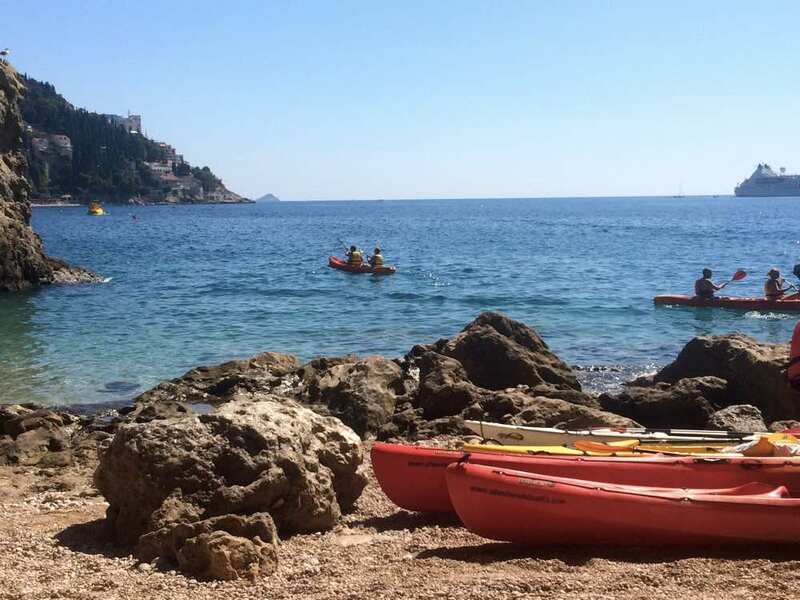 So when I knew I was going to Dubrovnik, I knew I wanted to do was a sea kayaking tour. 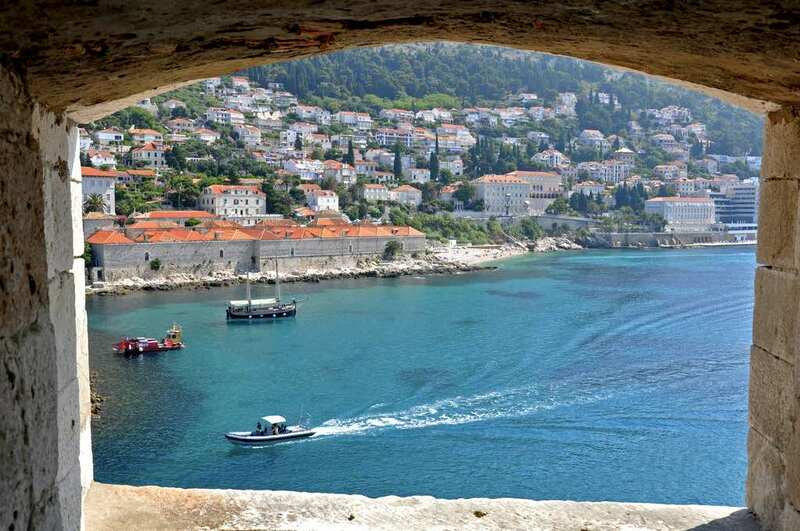 Go with Adventure Dubrovnik in a three-hour journey around the Lokrum island. Definitely one of the highlights of my whole road trip in Croatia. I stayed in the Lapad peninsula which turned out to be a great area in Dubrovnik. Just a short bus trip to the crazy Old Town, it allows you to be away from the tourist madness and have a little bit of beach time close by. 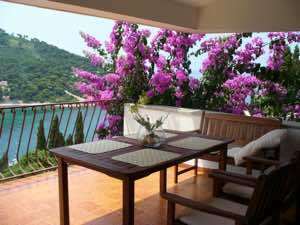 Just a 5-min walk from the beach, with a super friendly host, and a gorgeous view over Lapad area. Peristil in Diocletian’s Palace, Split. 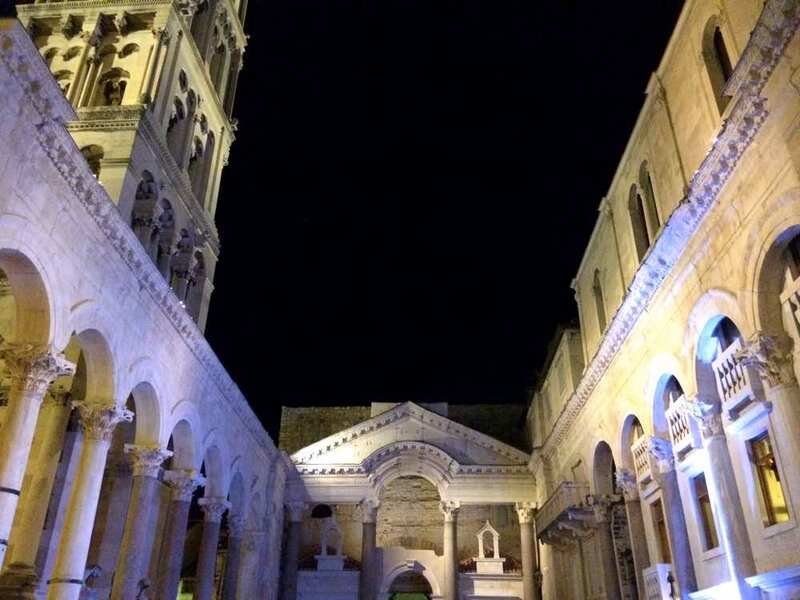 While the Old Town of Split is not huge, the Diocletian’s Palace itself is impressive in size and in state and the streets around seem straight out a medieval movie. Well, to be clear, the whole old town is the Palace so we’re technically talking about a huge fortress here! If possible, allow yourself to sit on the staircase in the Peristil (the main square) and take it all in. When I was there, the live singing was mediocre to say the least, but who cares when you’re having beer completely surrounded by Roman ruins?! Just a 4-min walk from the beach and 20-min from the Diocletian Palace, this is a great location. The apartments are clean, modern and tidy. You can also start your search with this pre-selected list of the best accommodation in Split city center, with free WiFi, and access to parking for your car. Beach in the island of Brac. The mainland Croatia on the horizon. If you seek clubbing and drinking, head to Hvar, known as the fashionable and party island. If you are more interested in watersports, Brač is a great choice for parasailing and windsurfing. 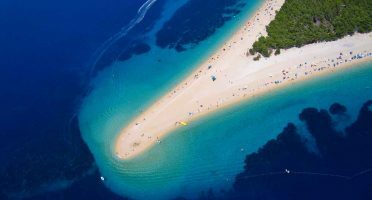 Plus, you’ll not want to miss the Zlatni Rat beach, as well as other stunning coves and bays in the island. 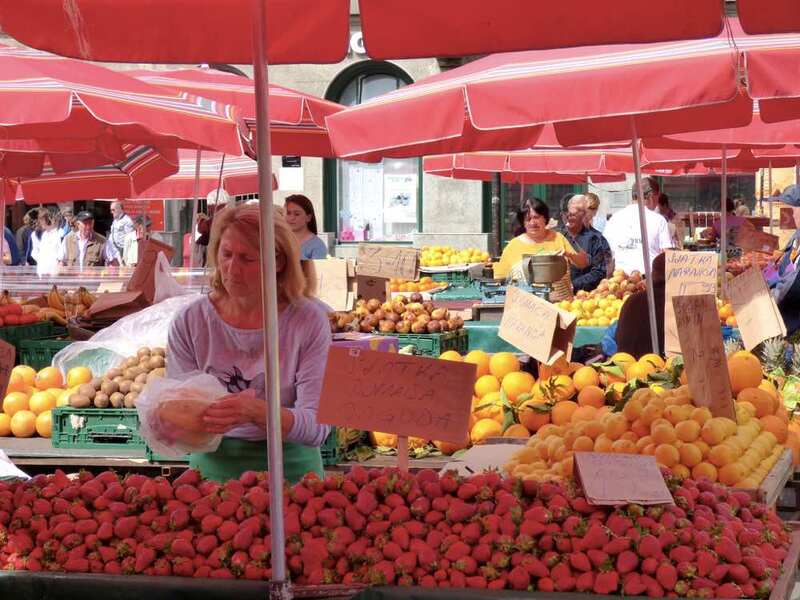 For organic food and drinks (including wines), head to Vis or Korčula. The Kornati or Mljet archipelagos are the best for unspoiled nature. Each island has its own vibe, so it’s a matter to find the one that has whatever you’re seeking in almost all one of them. If you’re travelling by car, bear in mind you can bring a vehicle in only some of the island routes coming from or going to the mainland. 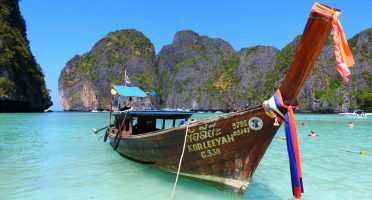 This can restrain your desired itinerary and island-hopping options. Always check the routes in Jadrolinija’s website or here beforehand. The main waterfalls in Krka National Park. Most tourists flock to Plitvice National Park (Plitvička jezera) for its stunning waterfalls, greenery and out-of-this world sceneries. But Krka National Park is no less amazing. Located further down near the coast, less than 15km away from Sibenik, it’s one of the major national parks in Croatia. Unfortunately I have no terms of comparison with Plitvice as I couldn’t visit it due to the bad weather, but Krka did not disappoint at all. Awesome unchanged nature views, lots of scenic hiking trails and an impressive set of waterfalls. 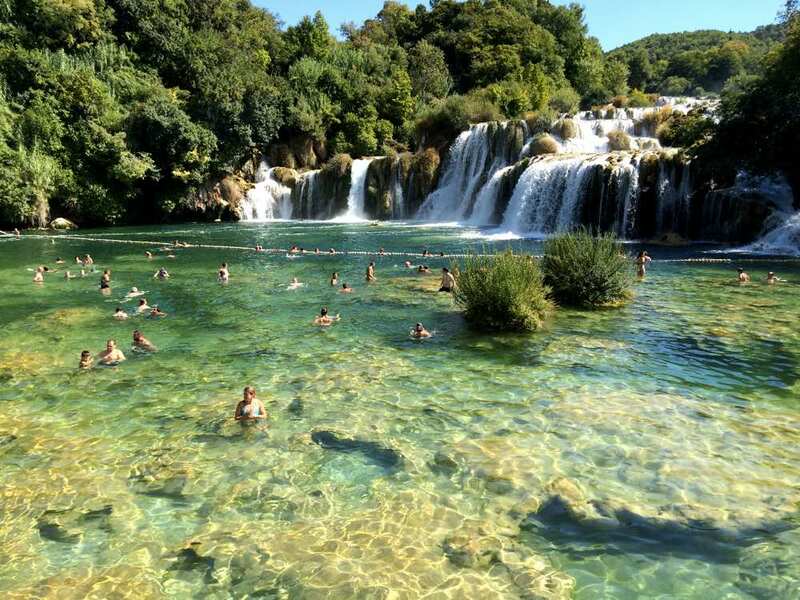 And Krka is also more interactive: you can actually swim in the (cold) waters near the main waterfalls, which on my view makes things a lot more interesting! Photo by Michael Stuff @ Flickr. You know me, there’s always gotta be something about food. And I have lots of love to give for Dalmatian cuisine. I think the secret was in the quality of the ingredients. There’s a huge concern everywhere about having organic products, often from local farms or small producers. There’s a reason why organic markets and small food stalls are so popular. This makes ordinary stuff delicious. Fun fact: I’ve never tasted such delicious tomatoes before! Another tip: although traditionally Italian, you can also get damn good gelato in Croatia. And the good news is that is cheaper: even in the more touristy places like Dubrovnik, a scoop is around 10 kuna (1,3EUR). My favourite dishes were the Paški sir, a delicious sheep milk cheese made only in the Pag island and the Pašticada, a traditional Dalmatian dish. It’s kind of a beef stew with dry plums, carrots, red wine and various herbs, and served with homemade potato gnocchi. Although the quality standards varied a lot between restaurants, when Pašticada is properly made, it’s freaking delicious. View from the walls of Dubrovnik. Photo by Jennifer Boyer @ Flickr. Did you know Dubrovnik once was an independent republic for many centuries? Stretching for almost 2km in length, this is almost a must-do when you’re in the Old Town of the city. Both the views to the maze of medieval streets and to the Adriatic sea are breathtaking. During summer months, it’s better to go early in the morning or late in the afternoon, to avoid the herds of tourists. If you’re not willing to pay the 200 kuna entry fee – a bit expensive if you ask me – you can climb the narrow streets of the old town up to the northern or southern walls where you can have peeks of great views as well. Probably not as jaw-dropping, but at least it’s an inexpensive workout! Dalmatian coast: definitely to come back! I’m becoming more and more a fan of road trips. After my favourite road trip itinerary in Portugal, I’ve found bliss again in this road trip in Croatia. 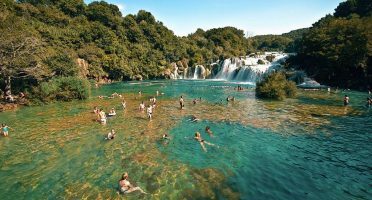 I was fortunate enough to accomplish all the bucket-list-worthy items in this list, but the Dalmatian coast is beautiful and different enough to have much more things to do and to experience. My trip to Zlatni Rat beach and to Brac island made me realise this is just the tip of the iceberg. Have you been to the Dalmatian Coast? Which experience would you add as #8?